It has been something of a frustrating weekend for me. I have these strange episodes where all my muscles just ache and I can’t find any energy to do anything and I end up doing very little physically. I happen to be in the middle of one of those episodes and it is extremely frustrating. The weather is nice and I want to get my garden winterized. Or go hiking with my husband. But instead of doing either, I curled up in the recliner for most of the weekend and read a book. A good book, mind you, but all the same… I am frustrated by the tenderness and ache in all my muscles. Harvey is frustrated with it, too. I took him for a walk every morning of the weekend and I kept my promise to him that each walk would be at least a mile long, but a mile isn’t long enough to wear him out and make him a tired but happy doggie. 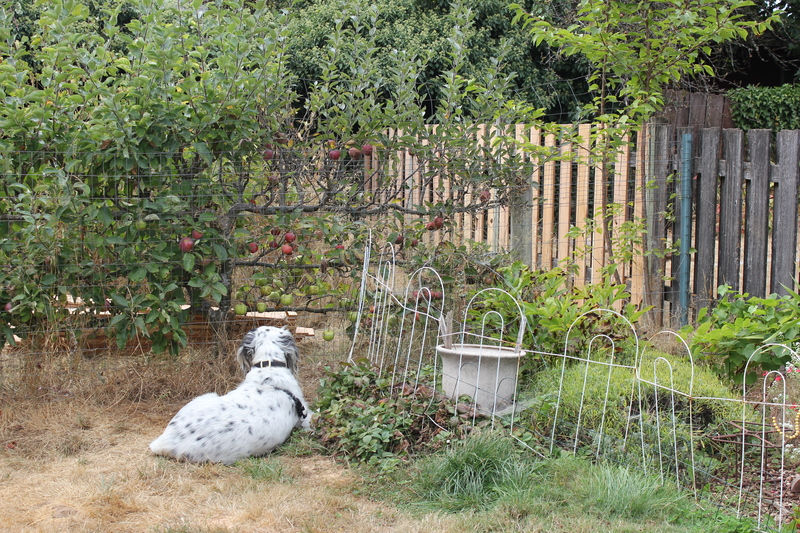 He has this doggie dream of breaking into the area where we (normally) have a vegetable garden. He wants to catch the cats that he thinks hide in there. He wants to finish tearing off the boards on the fence and escaping. He wants to Run Free. Have news for Harvey: we have begun the process of rebuilding the Fence That Harvey Ate. It cost us $83.00, so far. I think it will stay under $100.00, but the point is… Harvey is not allowed into the veggie garden area. Neither is Murphy, but he doesn’t sit and pine away along the fence like Harvey does. I asked Harvey today what was the matter. Don’t we love him enough? Isn’t he happy here? Why does he always want to run away? He came to me and I grabbed his collar. I praised him up one side and down the other, but I could see that he regretted his decision as soon as he was captured. All I knew was that if he had gone, I would have let him. I hurt too much to give chase. If this episode follows the cycle of episodes like it, in two weeks, I will feel fine. No aches, no pain, and lots of energy. In the meantime, I am down to just plain feeling like crud. In good news: once it gets dark outside, Harvey just wants to stay home. I think he’s afraid of the dark. Is it possible that you have fibromyalgia? Maybe you should get checked for it. In this day and age of wonderful medicine, there’s no point in being miserable. Hope you feel better soon friend. It sure sounds like fibromyalgia. I have that condition and am well-acquainted with its miseries. Doctors were never much help to me — it seems like all conventional medical practice wants to do is prescribe painkillers. I had to figure it out for myself with a lot of research, so for what it’s worth, here’s what I do: First of all, I try to get at least seven hours of good-quality sleep every night (that can be difficult, I know, but it’s really important). A sleep deficit can trigger fibromyalgia. I limit the amount of coffee I drink. I love coffee, but it’s very dehydrating and that exacerbates the condition, so now I have coffee as an occasional treat. I drink LOTS of water and/or herbal tea all day long. I take a calcium/magnesium/potassium/zinc supplement, at least 1000 mg. everyday, and a Glucosamine/MSM/Chondroitin supplement everyday, as well. It’s not just good for your joints, it really seems to help with painful muscles, tendons and sore spots, as well. By following this program, I am free of fibromyalgia and arthritic pain most of the time, and am able to keep up with all of the physical demands of having 13 big, energetic dogs. A nice, long soak in a warm bathtub doesn’t hurt, either. You should see a doctor or a naturopath about your pain and fatigue, though, and get a professional opinion. I’m not ignoring your reply or Jodi’s. In fact, one other person last week mentioned/suggested the same thing. I’d always ruled fibro out (for instance, I don’t have that “burning sensation”), but now I will rethink that. I’m not going in to see a doctor until November probably (when I need to renew BP meds) – at least not going in to see my GP where I can discuss this. I really appreciate the wisdom, Laurelle.